I first arrived in Thailand backpacking in 2003. Now I live in Bangkok and I’ve travelled around a fair bit of the country. Thailand gets over 11 million tourists visiting a year. It may be a developing country, but you can buy just about anything you want here, and cheaper than at home (assuming your first stop is Bangkok). As such, only bring a few items of clothing with you; you can buy tshirts, shorts, bikinis, jackets, trousers etc by the armful for very little cash when you first arrive. Same goes for sunscreen, sunglasses and the contents of your toilet bag. Getting laundry done is cheap and easy. Plus, given that it’s a tropical country and you’ll be pretty active, you’ll probably want to ditch your clothes after every couple of months anyway. See the complete rundown of what to bring and what not to bring on my Packing List For Thailand page. Before you leave home, make sure you shop around for the cheapest flight you can get to Thailand. Use flight comparison sites like Skyscannerto get an idea of the range of prices. Ask your local travel agent too in case they can best what you find online. (There’s more tips on finding cheap flights online if you’re interested). Even though you will have no trouble finding a McDonalds or Starbucks in Bangkok, Thailand is still very very different to America or Europe. Some snobby travel writers whine about Thailand becoming too Westernised and just like everywhere else. They’ve obviously walked around the country with their eyes shut. When you first arrive in Bangkok, you will find it extremely hot, incredibly chaotic and pretty overwhelming. You will be craving a McDonald’s just to go somewhere which is clean and quiet. At least, that’s how I felt. It helps if you’ve done a little reading beforehand of a guidebook like Lonely Planet Thailand. I’ve also put together my Bangkok Travel Guide: 55 Tips To Help You On Your First Trip To Thailand which covers a lot of the basics, and Bangkok On 30 Dollars A Day to help you get an idea of what you can do budgetwise. 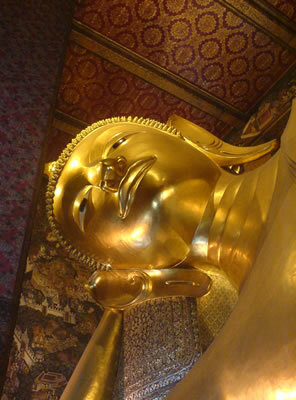 For a more comprehensive rundown of what things cost in Thailand, see my article How Much Money Do I Need For Thailand. After the first day or so, once you’ve got over the jet lag and started getting your bearings, you’ll begin to enjoy it a lot more. Most people begin their time in Bangkok staying around the Khao San Road area – and it’s a good place to be based, especially the Rambutri / Pa Athit area next to the river which is quieter and better value than Khao San itself. (See my guide to my favourite cheap Bangkok hotels) This is where you can stock up on cheap clothes and CDs, sample lots of great Thai food cooked up by street vendors, sit around in plethora of bars, meet lots of other travellers and generally chill out. You can also browse and book a bigger selection of Bangkok hotels online too if you’re looking for a little more luxury. There are some excellent boutique hotels in Bangkok if you want something unique too. 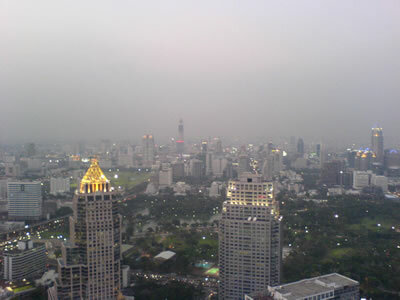 I have to admit, when I first got to Bangkok, I absolutely hated it. Now I’ve been living here for a year, I’ve grown fond of the city and found quite a few great things to do. So, even if you feel like leaving Bangkok the moment you arrive, give it a chance. You have to be prepared to brave the Bangkok traffic and get out of the backpacker ghetto – but you can avoid the roads by heading from Khao San down the river on one of the ferries to Saphan Taksin and get onto the BTS Skytrain there, which will take you all over BKK. Taxis are cheap and plentiful, but be prepared to get stuck in Bangkok’s notorious gridlock. Arm yourself with a copy of the Bangkok Groovy Map which is incredibly useful and easy to read – it’s like a guidebook condensed onto two sides of paper. You may also find Travelhappy’s Quick Guides to different Bangkok districts helpful – Khao San Road itself, the nearby historical Bangkok Riverside and Royal island of Rattanakosin, where Bangkok’s most iconic sights are located; plus the buzzing districts of Silom, Sathorn and further away the neon glow of Lower Sukhumvit and the trendy bars and clubs of Thonglor and Ekkamai in central Sukhumvit. 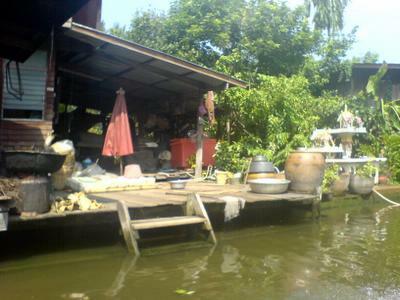 There are scores of other places you can visit in Thailand. 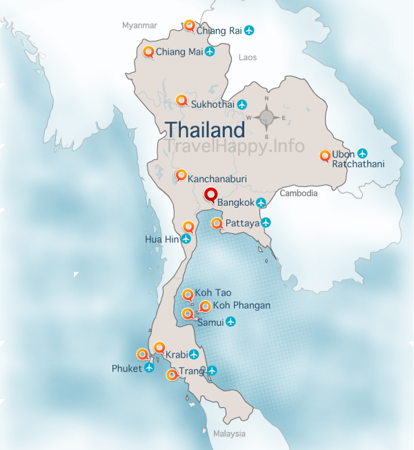 See Travelhappy’s Quick Guides to Thailand listed on our Thailand map. It’s worth reading your Lonely Planet Thailand guidebook and dropping into Thailand discussion forums to get the latest info on places you want to go, especially if you’re on a budget. Koh Samui and Phuket, for example, are pretty expensive places for backpackers – much better to head for Koh Tao, Koh Lanta and Koh Phi Phi if you’re looking for beautiful beaches and simple island life away from megabucks resorts and thousands of other people. There’s also spectacular scuba diving around these islands too. (See my other site Divehappy.com for more about Koh Tao scuba diving and Koh Lanta scuba diving). If you’re after culture, you can’t do much better than Sukhothai, the ancient seat of Thailand’s first civilisation and the country’s equivalent to Cambodia’s Angkor Wat. Sukhothai comprises of some spectacular temples with exquisite, ancient and sometimes gigantic statues of the Buddha which are impressive whatever your spiritual leanings. The temples are set in an immaculately kept park which lies within a valley – it’s a great taste of the Thai countryside. If you want to compare Sukhothai to Angkor Wat, it’s easy to fly from Bangkok to Angkor direct. If you are looking to get in touch with your spiritual side, you can do a Meditation Retreat with Thai Monks. Thailand also has some of the most colourful festivals in the world, like the water-pistol madness of Songkran in April and the beautiful water lanterns of Loy Krathong in November. There are also many regional festivals, like the stomach-turning self-mortification Vegetarian Festival in Phuket, where devotees pierce themselves with anything from swords to trees, and the Phi Ta Khon Spirit Festival every July where amazing masks and costumes represent the return of the dead. There are plenty of opportunities for volunteer and teaching work in Thailand, and for a foreigner it is the ideal way to see the real Thailand and live and work amongst the Thais. There are teaching jobs available all over the country which you can pick up quite easily while in the country. Teaching English In Thailand has the full details of what you can expect about trying to get an English teaching job in Thailand. For volunteer opportunities, check out TransitionsAbroad.com. Lastly, you might want to consider visiting one of the foreigners serving time in Bangkok’s prisons to offer some moral support and take some food and reading material – it’s a sobering reminder that while you’re in Thailand, you definitely should make sure you stay on the right side of the law. And there you have it – a quick guide off the top of my head to things I think are worth doing in Thailand. If you found it useful, you can always buy me a pint in Bangkok…Enjoy!